While politicians and economists argue whether British voters’ decision to leave the European Union was wise, British academics fear a damaging falloff in research funding, collaboration, and talent. Constantin Coussios, a professor of biomedical engineering at the University of Oxford, says he has “felt distinctly European my whole life.” Understandably so. Coussios is a Greek who was raised in Brussels, earned degrees at England’s University of Cambridge, and has worked and studied in Spain and France, as well as in Canada and the United States. But he and his wife have now sunk deep roots in Britain, where their three sons were born. He returned 12 years ago to join the faculty at Oxford, and he’s since also cofounded two start-ups: OxSonics, which sells an ultrasound-based cancer-drug delivery platform, and OrganOx, which markets a device to preserve organs before they’re transplanted. Oxford’s status as a global talent magnet was one of the things that lured Coussios there. “What makes Oxford an extraordinary place to work is the opportunity to attract the very best young minds from around the world,” he says. But Coussios now fears the hurdles to immigration that will undoubtedly arise in post-Brexit Britain could undermine efforts by Oxford and other United Kingdom universities to draw top researchers. It will be years before the full implications of Brexit are known. Negotiations between Britain and the EU to create a new framework for their relations could drag on to 2029 or beyond. But that long period of uncertainty could, by itself, have a corrosive effect on academic research. Across British academia, there are worries that the lead-up to Brexit could trigger an exodus of faculty and staff, jeopardize recruitment of academics, limit access to European funding and research partners, and generate a falloff in enrollments of foreign students, particularly graduate students. “We’re seeing a lot of anecdotal evidence of negative impacts,” says Stephanie Haywood, head of the Electrical and Electronic Engineering department at the University of Hull. One Italian professor turned down a job offer, she says, and two engineering postdocs from Europe opted to reject placement offers for fear of future visa hassles. One of Haywood’s colleagues at Hull, Guy Hembury, a chemistry Ph.D. who oversees a program that helps facilitate industrial-academic research, says he and his wife, Fabienne, may relocate to her home country of France, in part because of concerns that Britain is no longer welcoming to foreigners. To be sure, a relative handful of academics supported Brexit. But the vast majority resolutely opposed it. That’s because British researchers and universities have largely benefited from the relationship. U.K. universities receive around £1 billion ($1.25 billion) a year in research grants from the EU, or around 10 percent of their total research budget. Britain contributes to a pool of funds used to pay for grants, but it receives 60 percent more in grant money than it pays in. “The U.K. has a strong track record for securing EU research funding,” says Helen Atkinson, a trustee at the Royal Academy of Engineering and head of the Department of Engineering at the University of Leicester. While it’s hard to determine how much of that £1 billion goes to engineering research, Atkinson suspects it’s a significant portion. Back at Hull, for example, Haywood says 20 percent of the university’s research income is from Europe, but in engineering and science, it’s closer to 50 percent. The EU is also a major source of talent. Europeans account for 15 percent of academic staff across the U.K., and as much as 20 percent at some top schools. The British government has said it will formally notify the EU in March 2017 that it’s leaving. After that, according to EU regulations, Britain and the EU have two years to negotiate a split, during which time the U.K. remains a full member. But, says Michael Dougan, a professor of EU law at the University of Liverpool, because there are so many complicated issues to resolve, both sides could agree to extend the negotiations beyond two years, perhaps to four or five. 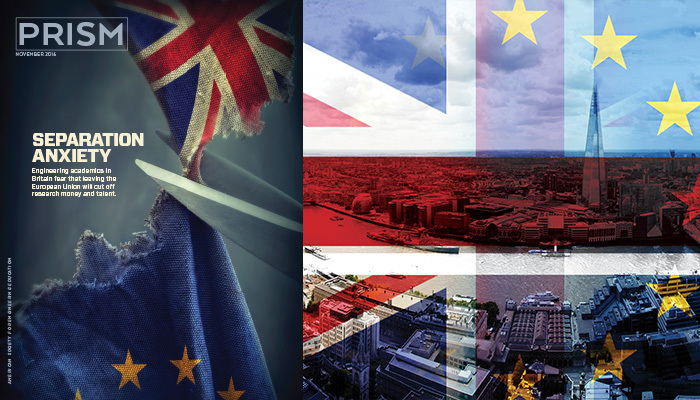 Once a settlement is finally reached, the U.K.’s EU membership will be terminated. But that’s not the end of things. Britain and Europe will next have to negotiate the terms of their future relationship. And that complex effort, Dougan says, could easily eat up an additional10 years, leading to a decade-long gray period, during which relations between U.K. universities and the EU will be in limbo. EU membership requires full acceptance of several bedrock principles, including free movement of people. It’s this principle that’s made it easy for academics and students to travel visa-free between member countries, helping British universities’ relations with their European counterparts. But many Britons voted “out” because they want less immigration. Conservative Prime Minister Theresa May has backed this sentiment, saying limits will be placed on Europeans immigrating to the U.K. once Britain leaves the EU. However, that stance could hamper applications for EU research grants and wreak havoc on the ability of U.K. schools to recruit staff from Europe. Europe’s biggest pool of research money is a fund called Horizon 2020, which, as the name suggests, will parcel out grants between now and 2020, after which another fund will be created. All EU members have access to the funds. But some pro-Brexit researchers point out that nonmember countries, including Iceland and Israel, have access to Horizon grants, too, and don’t accept free movement of people. However, Dougan says, because “the U.K. does disproportionally well when it comes to research funds, that makes it a bargaining chip for the EU. It’s not likely to give the U.K. full access to funds again until it sees what it gets in return. Politics plays a role.” Even if Britain does negotiate full access to EU funds, “we’ll have no voice in making policy whatsoever,” says Mike Galsworthy, head of the lobbying group Scientists for the EU and a senior associate researcher in health policy at University College London. That’s a big loss, he says, because Britain’s science community has played a major role in shaping European science priorities. EU grants and projects are also particularly strong at bringing in both large corporations and small and-medium-size companies to work with academic researchers, Leicester’s Atkinson points out. “That model’s been powerful, but it doesn’t really exist with purely U.K. models,” she says. The same is true for academic spin-offs, too. Neil Wilson is the CEO of Camfridge, a Cambridge start-up that’s developed a pollution-free, magnetic-based cooling system for domestic appliances. Since its launch in 2005, it has benefited from EU funding. “Those grants allow us to work with European industrial partners,” Wilson says. “If we get U.K. grants, we can’t do that.” Camfridge relies on a network of European academic and industrial research-and-development partners in large part because there are no refrigerator manufacturers in Britain. “Technically, we are not cut off from EU funding just yet, but no one wants to work with us—though there is a willingness on both sides—because the risks are too high.” Wilson says he’s already had informal talks with German and French officials about relocating the company to Europe, though it’s still just a possibility. Uncertainty over funding has already halted some potential collaborations between British researchers and European partners. Coussios says he’s concerned about the costs of losing “these extraordinary pan-European collaborations that facilitate validation of new technologies in different markets and clinical contexts beyond our own backyard.” In August, the U.K. government put out a statement promising to fund all committed European Union/U.K. research projects through 2019. But Galsworthy, of Scientists for the EU, calls that pledge “decidedly underwhelming,” considering those are payments that the U.K. was already committed to make. Concerns over how foreigners are treated in Britain could also hinder efforts to attract international students—and not just from Europe. A July survey of 1,000 prospective students around the world by Hobsons, a global education-services company, found that after the Brexit vote, a third had misgivings about studying in the U.K., and 6 percent said they definitely wouldn’t enroll in a British university. Currently, 40 percent of graduate students in the U.K. come from overseas, though the largest contingents are from China and America. At engineering schools, 16 percent of master’s graduates and 14 percent of Ph.D. graduates are foreign. However, the Conservative government wants to dampen international student numbers to help reduce overall net migration. Four years ago, when May was home secretary, she jettisoned rules that made it easier for foreign students to remain and work in Britain for up to two years after graduation. Since then, the number of international students attending U.K. schools has been falling. In the year from June 2015 to June 2016, it dropped 15 percent to 164,000, the lowest level since 2007. Now May says she wants to tighten student numbers even further. In a report in mid-October, the Royal Academy of Engineering challenged the government to ensure that Brexit doesn’t diminish Britain’s engineering skills base or its research capacity. The report notes that 22 percent of faculty members, 13 percent of undergraduates, and 24 percent of graduate students at the country’s nine top engineering schools come from other EU countries. Without access to European research funding, “the U.K. is likely to become a less attractive destination for the brightest and best students and researchers,” the report says. Higher education advocates say the U.K.’s attitude toward foreign students is self-defeating, noting that they annually contribute £8 billion ($9.9 billion) to the British economy. The crackdown on foreign students “is particularly troublesome in engineering, where we have a skills shortage,” Haywood says. “But we push these people away.” That certainly is a headache for British universities and engineering schools. But given the additional problems that Brexit will likely unleash, there are many more pains to come. Thomas K. Grose is Prism’s chief correspondent, based in the United Kingdom..